Cyclists who are unlucky enough to live in snowy climates will tell you just how hard it is to get around on two wheels when your city is buried in heaps of snow. Turkish firm Venn Design Consultancy came up with a slightly insane – but still all-around appealing – solution. 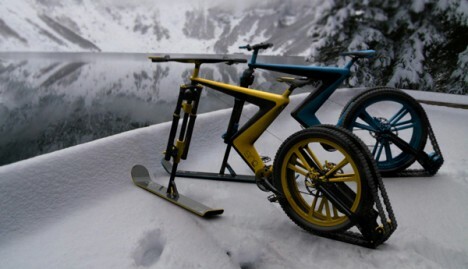 It’s simply and appropriately called ‘Sno.’ The bike features a ski in the front where a wheel would normally sit. On the back, dual wheels are given more traction with some heavy-duty treads for getting through slick patches. 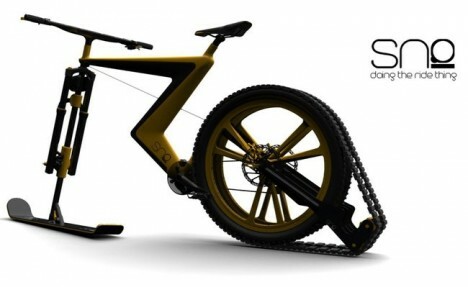 A minimalist design makes the Sno look futuristic in a post-apocalyptic sort of way. The frame sports an unusual Z-shaped formation which would probably undermine the strength and durability of the bike, particularly when riding over rough terrain. 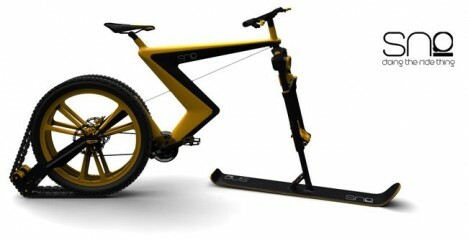 Sno is definitely a cool-looking concept, even if doesn’t seem completely possible to make it into an actual product someday. We’re still waiting for a viable non-motorized way to get around in the winter that doesn’t involve trudging through snow and slush on foot.